TOPAZ is a quick, simple and minimally invasive medical technique now available for the treatment of tendons and fascia. The TOPAZ MicroDebrider utilizes patented Coblation® technology, designed to specifically treat tendons and fascia. To date, over 5 million Coblation procedures have been performed. The TOPAZ technique has been associated with quick return to daily activities allowing for significant improvement in patient outcomes. Since obtaining original FDA clearance in 2002 and expanded indications for tendonotomy in 2005, TOPAZ has offered a minimally invasive alternative for thousands of patients for the treatment of tendons and fascia. Pain associated with plantar fasciitis is derived from the excess repetitive strain on the plantar fascia. The pain has little to do with the heel striking the ground. In fact placing something too soft under the heel will often aggravate the plantar fasciitis by letting the arch sink down lower thereby adding strain to the plantar fascia. Each time the foot strikes the ground, the heel hits first, followed by the ball, followed by the arch coming down. the plantar fascia bowstrings across the arch decelerating the speed at which the arch comes down. it is a shock absorbtion mechanism for the body. A foot that flattens too rapidly or too much overstretches the plantar fascia and it is the repetitive overstretching that leads to painful heels, Heels that display pain at the area which the fascia attaches to them. That flattening of the arch actually occurs with the foot rolling in too much, often called overpronation. Overpronation is often associated with heel pain. There is no cure all to plantar fasciitis despite the various "gadgets" being sold on the internet. The key to helping plantar fasciitis often is related to the ability to decrease the tension or strain on the fascia. An arch support which "props up" the arch can help but an orthotic which works by relieving tension from the heel and ball, the areas where the fascia attaches can be much more effective. Basicially, if one turns the heel inward and the ball of the foot the opposite way, tension is relieved from the plantar fascia. The goal of an orthotic is just to minimize that tension. If one can use the orthotic long enough to allow tension to be taken off the fascia, the fascia is no longer being overstretched and can heel itself. Plantar fasciitis which has been around for a long time can lead to a deposit of calcium at the heel bone along the area where the fascia attaches. When that deposit of calcium is viewed from the side, considering the fact that x-rays are two dimensional, one sees a pointy area of calcium referred to as a heel spur. The heel spur is really a "shelf' of bone or calcium deposited along the origin of the ligament and points in the direction of the toes. The so-called "heel spur" thus has little or nothing to do with the pain experienced but is a two dimensional manifestation of a three dimensional shelf of calicified fascia. The spur itself is not the cause of the heel pain but rather a manifestation of it. It is just an "island" of calcification or ossification (bone formation) that forms in the area of fascia that is chronically inflamed. 1) inflammation: This is a larger factor earlier in the process. This can be treated by anti-inflammatory drugs, ice massage, physical therapy modalitis such as ultrasound. Occasionally this is treated via a cortisone shot. Some patients beleive cortisone shots are always painful but that is only if poor technique is used in delivering the shots. First, the skin over the area to be injected should be numbed with a freezing spray like ethyl chloride. Then the area is to be injected from the side with lidocaine, a local anesthetic. Once the lidocaine has achieved numbness at the origin of the plantar fascia, the needle is left in place and the syringe changed to a syringe that includes a short acting cortisone (eg. dexamethasone phosphate), a medium acting cortisone (eg. celestone) and a long acting cortisone (eg. triamcinolone acetonide). The reason for using all three is to get the most complete effect possible. Keep in mind that cortisone does not cure plantar fasciitis (PF) but can calm things down considerably especially if it is early in the process and inflammation is the predominant process. One means increasing the efficacy of such injections is use of diagnostic ultrasound to better target the area of inflammation. Overuse of cortisone injections can lead to rupture of the plantar fascia or even worsening of plantar fasciitis. 2) biomechanics: This is the most important factor for most cases of plantar fasciitis particularly those that have been around for a while because this is treatment of the excess tension on the fascia. The professional, either a podiatrist (foot doctor) or a pedorthist (professional shoe fitter) takes a mold or image of the foot in the corrected position. The key is that the foot is molded in the corrected position; if one was to simply have on step in a foam box, one would capture the foot in the position the foot wants to go into. The professional watches the patient walk, takes a number of measurements and then uses the corrected cast along with the collected data to order the prescription orthotic. Occasionally, heel pain caused by the excess plantar fascia tension can be helped by a change in shoegear or even an "off the shelf" orthotic. Be aware that there are non-professionals who attempt to sell non-custom made orthotics as the real thing. They are still around because occasionally such devices can work but use of such devices can be a trial and error process for heel pain relief. 3)tissue quality: This involves a degeneration of the fascia caused by long term, chronic inflammation of the fascia. This is also termed, "plantar fasciosis." Our bodies handle chronic inflammation very poorly so if the fascia has been inflamed for a very long time, it may not heal no matter what is done. Usually, when we treat the inflammation and correct the biomechanics, this takes care of itself. 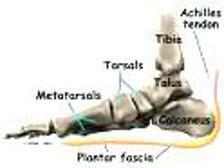 If that does not happen, the common treatment used to be surgery, that is, cutting the fascia off the heel bone. Most such surgery has been replaced with extracorporeal shockwave therapy (ESWT) in which repeated shockwaves are applied to the fascia and now via coblation therapy via the TOPAZ PROCEDURE. ESWT converts the chronic inflammation to acute inflammation which the body handles very well by repairing the fascia, getting rid of scar tissue and bringing in new blood vessels (neovasuclarization). ESWT can be accomplished via one or two high energy session involving anesthesia or by low energy ESWT in which 3 low energy sessions are used in place of one high energy session and no anesthesia is needed. ESWT is successful 70 to 80 percent of the time when the plantar fascia does not respond to conventional treatments. One financial issue to consider is that ESWT has very limited coverage by health insurance companies so it is generally an out of pocket expense. Coblation therapy is generally a covered service. Plantar fasciitis is often diagnosed by history of the disease process. Most patients note heel pain or arch pain upon arising after rest. Often, the harder they have used their feet the day before, the more tender the heel will be upon arising the next day. The examiner also looks at the "mechanics" of the foot, watching the patient walk. Individuals with plantar fasciitis often have feet that roll in (pronate) too much. Such feet often flatten too much with weight bearing pressure, placing tension on the plantar fascia. That can happen to an individual with a high arch, low arch or a medium arch. One does not have to be flat footed to have heel pain. Conversely, a foot that oversupinates or rolls out to much can also develop plantar fasciitis. Fewer oversupinators exist than overpronators. Sonography involves the use of diagnostic ultrasound to look at the fascia itself. Remember that the fascia is a ligament so it does not show up on x-rays. X-rays can be helpful to rule out things like stress fractures, arthritis, tumors but does not show the fascia. Sometimes calcium will deposit itself along the origin of the fascia, especially when the fascia has been inflamed for a long time. Since x-rays are two dimensional representations of a three dimensional object, one can see, from the side, a shelf of calcified ligament which is termed, somewhat mistakenly, a heel spur. Heel spurs, in actuality, do not exist but are simply a side view of the plantar fascia, showing a shelf of calcified ligament. The so-called spur always points forward in the tdirection of the ligament and is not the sources of the pain. Role of weight, occupation, time on feet. The more weight one has on their feet, the more tension is placed on the plantar fascia. That is true whether one is overweight or has an occupation which involves standing for long hours on hard surfaces. People's occupation often cannot be readily modified but your doctor can order light or modified duty. Additionally, a doctor can do something as simple as writing a note to an employer requesting use of preferred shoegear. Preferred shoegear may include shoes with a lot of cushioning and pronation support, running shoes like the New Balance 1540, New Balance 928 (the all black or all white version of the 1540), the Brooks Beast or the Brooks Addiction 11 (the all black or white leather version AKA the Addiction Leather). Use of the right prescription orthotic in the shoe can render a shoe to become therapeutic in the standing process. There are fewer shoes built for oversupinators. The ASICS Kayano is a good shoe for an oversupinator with heel pain. Body weight is a tougher subject. Nevertheless, if you have heels that are sore enough to make it tough to get through the day, then it may be hard to do certain exercise as walking. Keep in mind that almost all exercises can be done in an aerobic (fat burning) fashion when using lighter reps but higher frequency.